Researchers have found white dwarf stars with masses close to the maximum stable mass (called the Chandrasekhar mass) are likely to produce large amounts of manganese, iron, and nickel after it orbits another star and explodes as Type Ia supernovae. 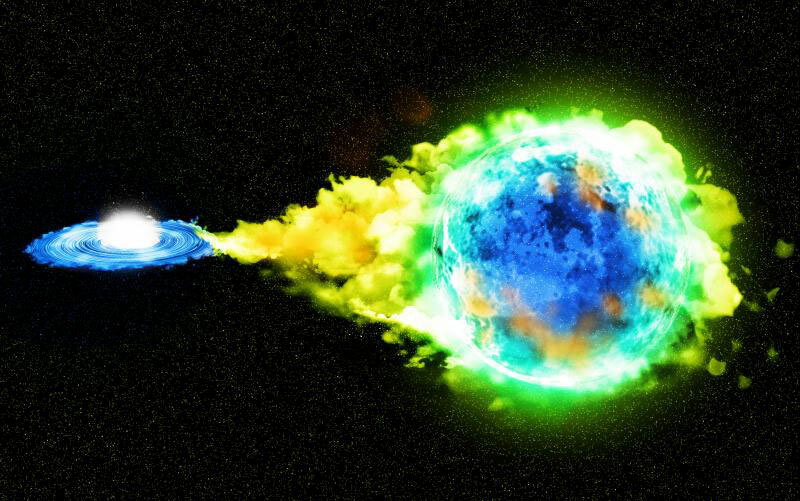 A Type Ia supernova is a thermonuclear explosion of a carbon-oxygen white dwarf star with a companion star orbiting one another, also known as a binary system. In the Universe, Type Ia supernovae are the main production sites for iron-peak elements, including manganese, iron, and nickel, and some intermediate mass elements including silicon and sulfur. However, researchers today cannot agree on what kind of binary systems triggers a white dwarf to explode. Moreover, recent extensive observations have revealed a large diversity of nucleosynthesis products, the creation of new atomic nuclei from the existing nuclei in the star by nuclear fusion, of Type Ia supernovae and their remnants, in particular, the amount of manganese, stable nickel, and radioactive isotopes of 56-nickel and 57-nickel. 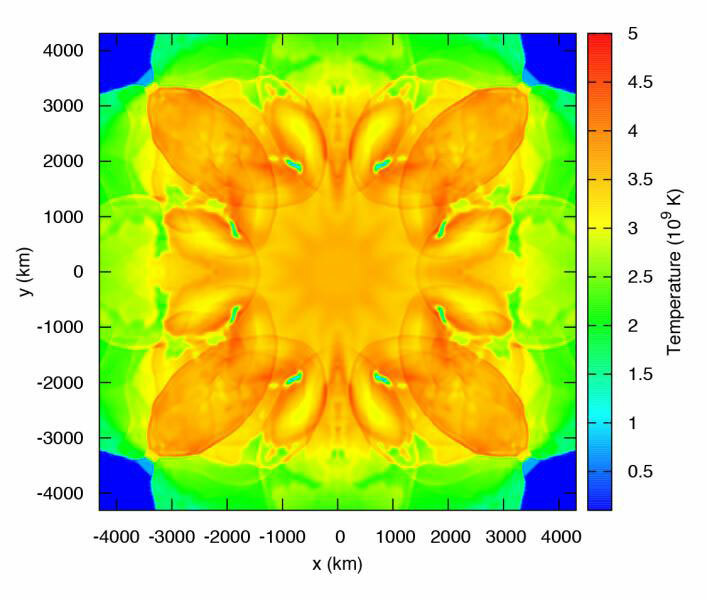 The colour plot of the temperature distribution of the benchmark Type Ia supernova model at about 1 second after explosion. The deflagration model with deflagration-detonation transition is used to produce this result. Credit: Leung et al. Distributions of representative elements ejecta velocity in the typical Type Ia supernova after all major nuclear reactions have ended. Colours represent the sites where the corresponding elements are produced. The arrow indicates the motion of ejecta. Credit: Leung et al. 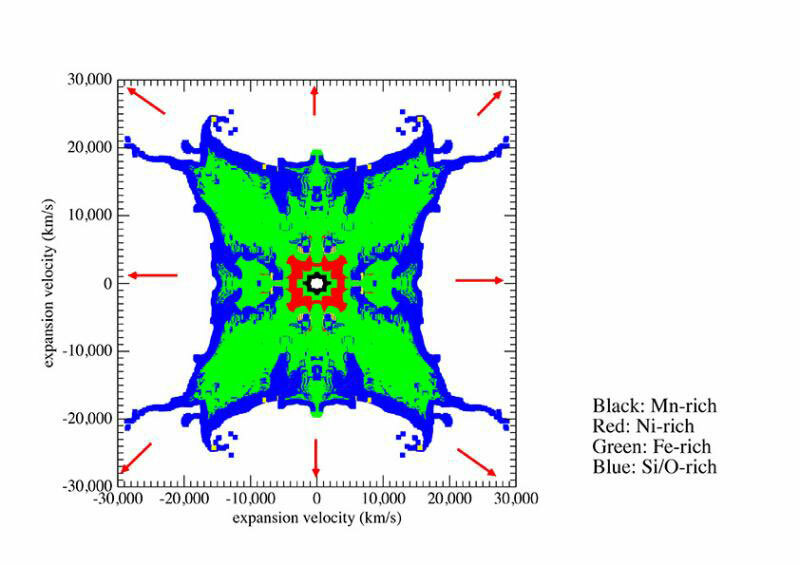 A particularly interesting case was the supernova remnant 3C 397 (figure 5). 3C 397 is located in the Galaxy about 5.5 kpc from the center on the galactic disk. Its abundance ratios of stable manganese/iron and nickel/iron were found to be two and four times that of the Sun respectively. Leung and Nomoto found the abundance ratios among manganese, iron and nickel are sensitive to white dwarf mass and metallicity (how abundant it is in elements heavier than hydrogen and helium). The measured values of 3C 397 can be explained if the white dwarf has a mass as high as the Chandrasekhar mass and high metallicity. 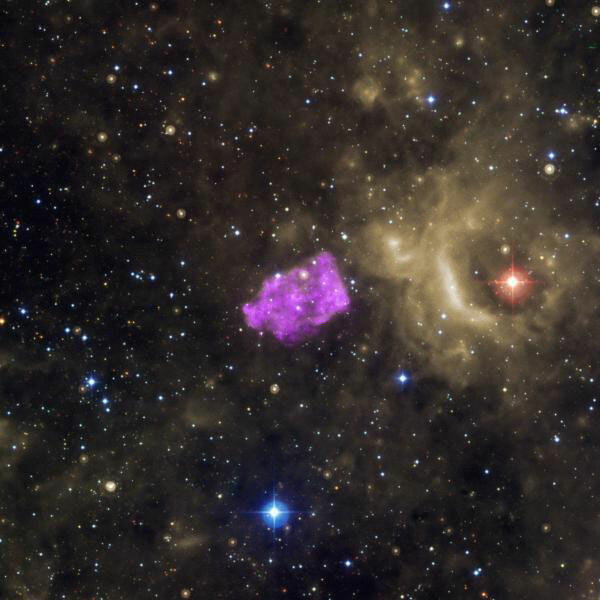 Be the first to comment on "Scientists Discover Why Some Supernova Explosions Produce More Manganese and Nickel"